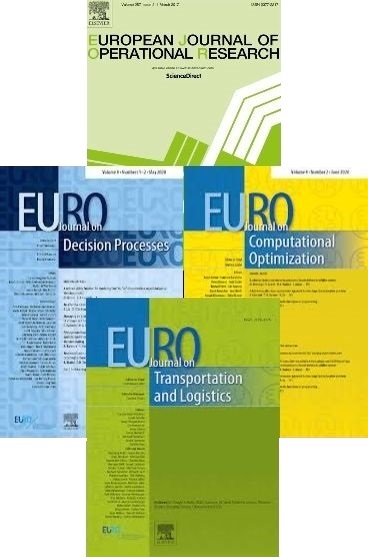 For small groups of researchers interested in a specific Operational Research topic, EURO provides an organisational framework in the form of EURO Working Groups. These Groups are a very important part of EURO. They provide a forum for promoting research in the areas represented by EURO. Active EURO Working Groups have a meeting at least once a year where the members exchange ideas, experiences and research results, and support each other in research work. In addition to their annual meetings, the groups also have other ways of working; for example they organise sessions in conferences, publish feature issues of the European Journal of Operational Research or other OR journals, and organise conferences or seminars. Several EURO Working Groups were established at EURO I and have been active ever since. Others have followed in their wake and some have been dissolved. An account of the early history (up to 1983) can be found in J. Krarup, Profiles of the European Working Groups, EJOR 15 (1984) 13-37. Since 1993, the liaison officer between EURO and the Working Groups is the Vice President 2. Each EURO working group section in EURO website contains a report of the activities of the each group, prepared by each EURO Working Group coordinator. The European OR research community has a long tradition in organising working groups on many aspects of Operational Research. The first EURO Working Groups date back to 1975 and are still active. In the meantime, new fields of OR became hot topics and their own Working Groups were created. Since the year 2000, six new Working Groups were formed, and a further one is planned for 2004. At the EURO Conference in Budapest, the Working Group on Human Centered Processes (HCP) started its activities. Also in Budapest, Working Groups on experimental economics and on metaheuristics were discussed. These two Working Groups E-CUBE (European Working Group on Experimental Economics) and EU-ME (European Chapter on Metaheuristics) commenced their activities at the start of the year 2001. The European Working Group on Ethics and OR started its life in 2001 at the EURO conference in Rotterdam. The two newest groups are ESICUP, the EURO Special Interest Group on Cutting and Packing, and OR in Agriculture and Forest management. Both groups will hold their first meetings in 2004. Since then, working groups on Network Optimization, Stochastic Modelling, OR for development, OR in Computational Biology, Bioinformatics and Medicine, Advances in Preference Handling, OR in Sustainable Development and Civil Engineering, Pricing & Revenue Management and on Vehicle Routing and Logistics Optimization were established. Currently, EURO hosts 28 Groups, with the last one established in 2011. These facts reveal that the original initiative of EURO to install such an organisational framework has proven to be very successful. A major reason for their success lies with the EURO Working Group co-ordinators. By their personal effort to motivate and organise the activities of their respective Groups, they contribute in an essential way to the organisation of special sessions in conferences and/or to the publication of relevant papers in special issues of highly regarded OR-related journals. The success of EURO Working Groups can also be attributed to the individual members, many of which find an opportunity to meet on a regular basis. At specialised Working Group meetings, they may exchange ideas, experiences and ongoing research results with colleagues interested in the same OR topic before an actual publication is produced. As a consequence, many fruitful European research partnerships are emerging. Why not join a EURO Working Group? Individual members of any EURO member society can benefit from joining a EURO Working Group in several ways: usually the Groups organise regular meetings which provide an excellent means to meet colleagues working in the same field, to exchange ideas and research results, and to find new scientific partners. Through the efforts of the Working Group Coordinators, these meetings take place in a friendly and stimulating atmosphere. By organising special issues in OR-related journals, members of a Working Group have a better and more effective outlet for publicising their ideas and results. Cooperation within the Groups is smooth, and the personal relations among members of the Group can be described best with the word friendship. For EURO, the Working Groups provide continuity in research. The Groups are a very important part of EURO, and the work of the co-ordinators and the members of the groups is very well respected and appreciated. If you want to get more information about a EURO Working Group or to join one, contact either the co-ordinator of the Group or the second vice-president of EURO. How to create a EURO Working Group? If a group of researchers and/or practitioners cannot find an established EURO Working Group with the OR topic that interests them, it is possible to submit to the EURO Executive Committee a proposal for a new EURO Working Group. As far as possible, the EURO Working Groups should bring together people with different professional backgrounds, i.e. researchers, practitioners and OR educators. The group should ideally have a European membership. This requirement is met if at least 4 European countries are represented at each meeting, and if the meetings do not take place too often in the same country. Any group should be open to any individual member of any EURO member society. Persons that are not members of a national OR society can also be accepted but the coordinators have to belong to an EURO member society. Becoming a EURO Working Group brings duties and advantages to the group. One of the duties is that the co-ordinators of the Working Groups have to report yearly on their activities to EURO. One of the advantages is that the Working Group obtains organisational support from EURO. EURO K conferences provide time and space for the meetings of the Groups, and the meetings can be set within the framework of the conference itself. Nowadays, several Working Groups organise their meetings on the day(s) before a EURO K conference starts, or on the day after it finishes. Another advantage is that a Working Group obtains financial support from EURO. Funding can be granted, for example, to help cover administrative costs in the establishment of a new EURO Working Group, and for seminar/workshop expenses such as the costs of inviting guest speakers or for subsidising students who attend the meeting. More details on the organisation and activities of Working Groups are stated in the charter of the EURO Working Groups. More information about Working Groups can be obtained from EURO. The EURO-officer in charge of Working Groups is the second vice-president.